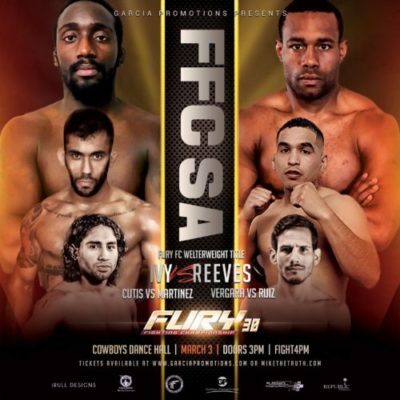 Fury Fighting Championship returns to San Antonio, Tx for Fury FC 30. The event will take place at Cowboys Dancehall, on Sunday, March 3. Headlining the card, Anthony Ivy will defend his welterweight title against Houston’s Aaron Reeves. Ivy (5-2) captured the title at with a submission win over Washington Luiz at Fury FC 26. Reeves (6-1) will make his return to the cage after a year layoff, his most recent win was a split decision victory under the LFA banner. Check out the rest of the card below. Support the fighters by purchasing your tickets here at MikeTheTruth.com.